A little over a year ago, I posted a video of a live performance that featured the Assembly of Light choir, who collaborated with the doom juggernaut The Body for their 2010 release, All The Waters Of The Earth Turn To Blood. It was revealed that an Assembly of Light LP will see release in the coming month or so, though there's apparently no set date. The choir continues their left coast tour with The Body and Braveyoung. Remaining live dates can be viewed below. All info comes courtesy of Earsplit PR. At A Loss Recordings is proud to announce the pending release of one of the most unique musical acts in existence. 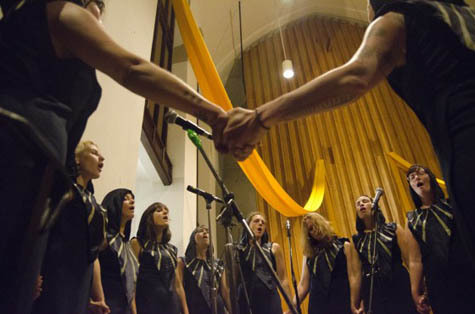 Featuring nearly two dozen members, Providence, Rhode Island-based ASSEMBLY OF LIGHT choir is a secular all-female choral faction, unifying their incredible range of voices into beautiful, and often undeniably eerie, ethereal hymns, which blend classical styles through their own artistic experimentation and tactics. Formed in 2008 by vocalist Chrissy Wolpert, the ASSEMBLY OF LIGHT has showcased their craft live regionally since their inception, at times simply with half of the group present, and others with the entire 20+ members performing, and have collaborated with other vocalists and musicians often. The most notable of these collaborations and appearances on record would inarguably be the choir's massive inclusion on the 2010-released All The Waters Of The Earth Turn To Blood, the acclaimed sophomore LP from apocalyptic doom duo, The Body. Following the release of the album, both bands toured the East Coast extensively, each performing their own set and collaborating on songs from All The Waters... live. The forthcoming self-titled full-length from the ASSEMBLY OF LIGHT choir was captured at Providence's Machines With Magnets, with members of The Body, Braveyoung, Work/Death, Daughters, and more taking part in the recordings. At A Loss will release the album later this Summer, with a final street date and full album info to be announced shortly. Coinciding with the release of the album, the unit will take to the road, touring the West Coast alongside labelmates Braveyoung and The Body, where each band will not only perform their own full sets, but all of the members will also collaborate live on stage throughout each set as well. View live footage of the ASSEMBLY OF LIGHT and more AT THIS LOCATION.